I didn't get round to blogging yesterday because we'd met up with the Campbells on Waimaru for a cup of tea and what with one thing and another didn't finish with them until late. 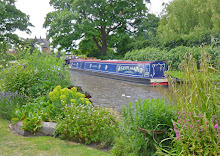 They'd worked up from Shardlow during the morning and we rendezvoused with them by Potlock's Bridge in mid afternoon. After tea and goss on board, we all came back to the marina to examine the Boardwalk, take a look at the outside of Walnut Lodge and we ended up on Sanity Again for a glass of wine. When the idea of meeting up had first been mooted, we'd hoped that the Bistro would have started trading, but that's not going to happen until early next month now. So I broke out some supplies from the store cupboards and we ate on board. We're meeting again at half ten in the Willow Tree for hot chocolate so I thought I'd get a quick blog post done to both catch up and anticipate not being able to do one later. Apart from socialising, the two main tasks today are the Monday wash (Sheila) and getting the Owners' Group database as complete as possible ready for the transfer to the new site in its new home.